Summer is a time for joy and jubilation, during which you and your family can enjoy various adventures. Though it’s great to get outdoors and bask in the sun, indoor activities can be fun, too. With a little creativity, you can rescue your kids from boredom, and have fun yourself, as well! Thinking of things to do isn’t always easy. This article offers some inspiration for a great summer. There is something for everyone, so you can pick and choose, depending on your circumstances. With these ideas, you can do more than create amusement. You can stimulate minds, too. Unlocking your culinary skills is a great way to spend free time. If you can cook, rather than rely on processed foods, you’re one step closer to achieving better health. If you have children, teaching them how to cook is an essential area of development, because you’re equipping them with positive skills they can use in everyday life. By researching online, you’ll discover various simple recipes anyone can follow. So, don’t feel discouraged by the misconception cooking is difficult! Just be aware of measurements, prioritize safety tips, and engage with the entire process. Cookbooks are a great source for cooking tips and ideas. If you’re a beginner, why not start with something basic, and gradually increase the difficulty of your efforts? If you don’t have a trampoline, buying one is highly recommended. Not only is it great exercise, it’s also something the whole family can enjoy. Trampolining is a great incentive to get outdoors. Whether you engage in twists and turns or simply enjoy bouncing around, you can vary your activities, depending on your individual circumstances. If you’re wondering what trampoline to buy, acon trampoline reviews is a great source of education. Here, you can learn which trampoline is perfect for you, with product reviews, buying guides, and links for purchases. Expeditions in nature are great for broadening your horizons. The tranquility of being in nature is unprecedented, and it will give you a new appreciation that is untainted by the hustle and bustle of everyday life. Taking your kids on a walk is a great way to ensure they release pent up energy. After going out for the day, you can be certain they’ll sleep well in the evening. Whether you explore nature or simply take a walk through your neighborhood, it’s good to experience the great outdoors with an activity that doesn’t break the bank. 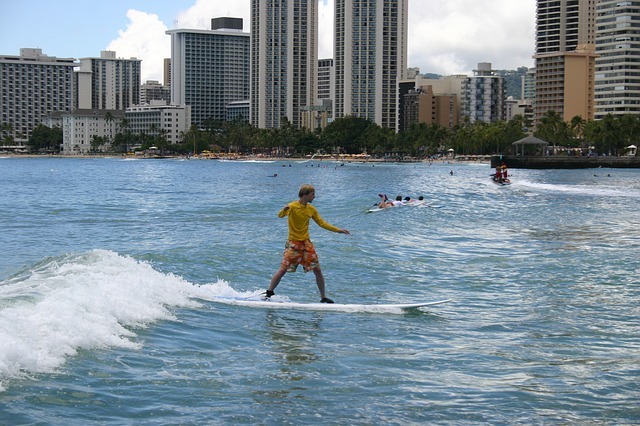 If you live near the ocean, or even near a large lake that gets waves, why not start surfing? Get out your old board and trek out to the water. Surfing is a superior way to enjoy the sun and the water, and it’s excellent exercise. If you’ve never surfed before, this might be a great time to learn! You can learn from a friend who’s good at it or by taking lessons. Even if you already know how to surf, you might want to take Advanced Surf Lessons. In fact, the regularity of a class or a lesson may be a great way to ensure you’re doing at least some activity every few days. Heck, even if you have no inclination to surf yourself, it’s a blast to sit on the sand and watch expert surfers to their thing! Nothing says summer time like a barbeque! This is a great opportunity to unite family and friends. What could be better than relaxing outdoors with great food, drinks, and games? Once you bring people together for a BBQ, there are various activity options that open for you and your family, especially once friends invite you to their summertime barbeques! This is especially exciting for kids. It’s also a great way to recycle cardboard and other items you’d otherwise discard. You can use items like rubber bands and a tissue box to create a guitar, or create your own didgeridoo using a cardboard tube! This is a great opportunity to get creative, and it will encourage your kids to be musical. Who knows? You might even unlock your kid’s hidden musical talents!